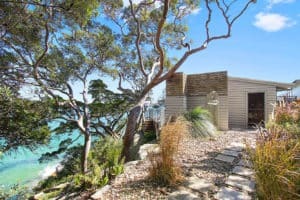 The House On The Rock at Bundeena is only a 60 minute drive south of Sydney. Once you join the princes highway, you remain on the highway and exit at the Royal national park turn off. Drive through the spectacular Royal national park, past Audrey and past the turn off to Mainbar until you see signage to Bundeena. The house is a 5 minute drive once you enter the village of Bundeena. Alternative you may want to catch the ferry from Cronulla. The house is a 5-10 minute walk from the ferry stop. © House On The Rock. All Rights Reserved.